On a recent trip to Bangladesh I collaborated with Dr. Bishawjit Mallick (Chair of Environmental Development and Risk Management at Technische Universität Dresden), the environmental activist collective Riverine People, and Professor Md. Monirul Islam at Dhaka University, and representatives of the School of Environmental Science and Management at the Independent University of Bangladesh and the International Centre for Climate Change and Development to organize a workshop on River Navigability and Inland Shipping in Bangladesh with a focus on the economic impact of formal and informal use of inland waterways for passenger and cargo traffic. The workshop, which took place on July 7 at the Centre for Advanced Research in Sciences at the University of Dhaka, featured presentations on recent scientific developments on the changing navigability of large and small rivers in Bangladesh, with emphasis on the infilling of smaller river channels in areas that have experienced extensive use of embankments (poldering) for flood control and reclamation of intertidal land; on national and international political considerations, including initiatives by the Government of Bangladesh and the challanges to managing international relations around transboundary rivers. Satellite remote sensing has introduced powerful new capabilities for monitoring changing river channels on regional, national, and international scales. A recent publication from my NSF Coastal SEES project showed that in regions subject to extensive poldering (surrounding intertidal and low-lying areas with large embankments for flood control and land reclamation) have experienced significant infilling of channels, with corresponding loss of drainage and navigability. Some of this infilling has proceeded naturally from the impacts of polders on sediment transport, and some appears to have been the result of deliberate blockage of channels in order to transform them into agricultural land or aquaculture ponds. Such infilling can block important inland shipping channels, forcing ships to follow other, and potentially more hazardous routes and this may have contributed to a series of shipwrecks in the environmentally sensitive Sundarban mangrove forest in recent years, including a 2014 incident that spilled 92,000 gallons of oil into the Shela and Pasur rivers. New open-source tools can work with freely available satellite remote-sensing data to automate much of the work of identifying and measuring river channel networks. A collaborative project between Vanderbilt, University of Texas, University of Colorado Boulder, Louisiana State Universtiy, and Old Dominion University is applying these tools and methods to river networks in the Ganges-Brahmaputra-Meghna delta. Dr. Muzibur Rahman Howlader, Chairman of the National River Conservation Commission of Bangladesh reported on actions by the national government of Bangladesh to restore and revive the inland waterways. Professor Ainun Nishat of BRAC University, a noted expert on water and rivers, described challenges to managing the dynamic river systems of Bangladesh and emphasized the need to restore river navigability using ecologically and environmentally sustainable practices. Sheikh Rokon, the Secretary-General of Riverine People discussed the role of historical waterways and offered a hopeful outlook in which responsible management of these waterways could also contribute to improved relations between countries in South Asia. The workshop concluded with a sense of appreciation for this kind of open exchange of information among a diverse international group of experts and stakeholders, and a desire to see more such workshops in the future. 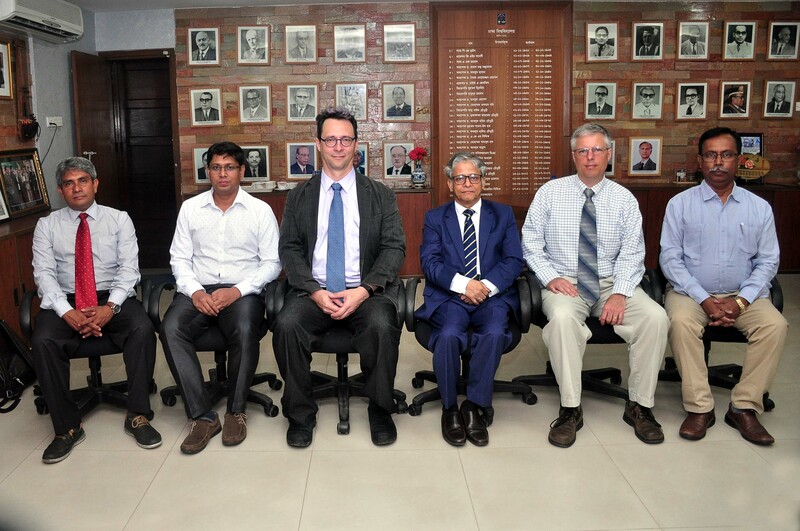 After the conclusion of the workshop, I joined other researchers from Vanderbilt in meeting with experts at Bangladesh University of Engineering and Technology and the Bangladesh Inland Water Transport Authority to discuss the exchange of data and other information about inland shipping. Steve Goodbred, chair of the Department of Earth and Environmental Sciences and I met with the Vice Chancellor of Dhaka University, the Dean of the School of Environmental Science and Management at Independent University of Bangladesh, and with Saleemul Huq, director of the International Centre for Climate Change Adaptation and Development to discuss areas of common interest and prospects for building formal relationships and international research collaborations between our institutions.